I just felt today like I needed to post a sunset photo for all those Valentine Loveducks out there. The weather in Nuremberg during the day was quite nice although still too cold. But with some haze and clouds out and about there was no such thing as a nice sunset. Don’t remember when I saw the last nice one, might have been the one I saw from the plane when arriving to Los Angeles the other week. 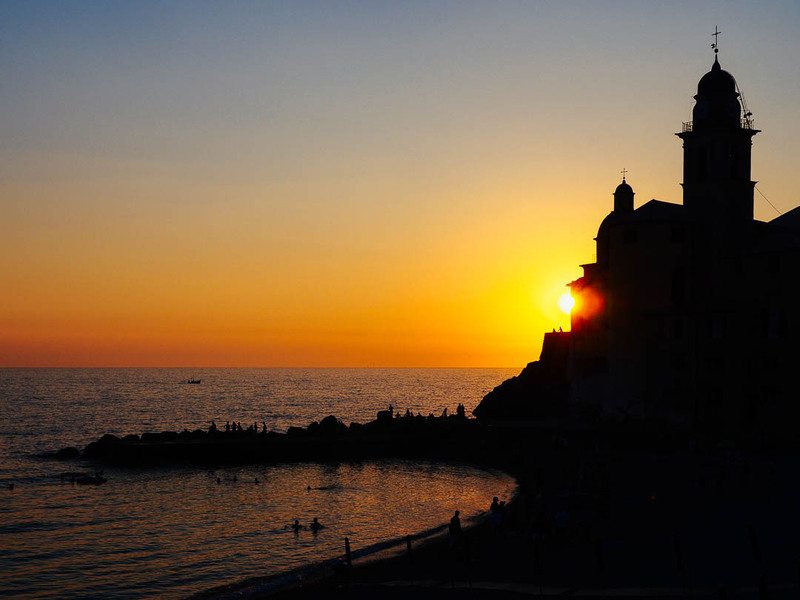 As the weather forecast for my next business travel destination (going to Portland via Seattle tomorrow) calls for torrential rain, I decided to go into last years archive and post this beautiful sunset from the little town of Camogli on the Riviera di Levante near Genoa. Not without reason this coastal part of the Ligurian Sea is called Golfo Paradiso. The pebbled beach with the colorful historic town houses (there is an image in this post here) is the perfect swimming destination with crystal clear water and splendid views of the Monte di Portofino, and the sunsets behind the Basilica Santa Maria Assunta and the Castello della Dragonara are one of a kind. And for all you Valentines out there, on the terrace above the beach are plenty of great cocktail bars. I took the photo with my Olympus PEN-F with the mZuiko 14-150mm F/4.0-5.6 travel zoom. Image specs are 1/320 sec with f/10 and ISO 200, focal length was 22mm (equals 44mm in full frame equivalent). RAW conversion was done in Adobe Lightroom CC where I applied the VSCO 4 Fuji Astia 100F+ preset to warm up the image slightly. Have a great Valentines Day ! Mist, da hätte ich echt den Kommentar des anderen Beitrags eins zu eins übernehmen können 😉 Sehr cool! Wonderful, rich colors and the silhouette with the sun peeking through is stunning, Marcus. Happy Valentine’s Day to you! Always pretty shots (jealous 😄). Have a great Valentines! So beautiful! Enjoy Portland- always wanted to go! Thanks, Chloe, your kind comment is much appreciated 😊🙏! Will have plenty opportunity to report from my Portland experiences over the summer, the next three trips are already scheduled….Happy Valentine to you! Blissful – happy Valentine’s Day ! Nice capture! Happy Valentine’s Day! Thanks, Vicki! Happy Valentine for you too! And wish you and Ash much sleep! Sometimes I don’t find sleep because my girl is not coming home on weekends. And being 19 she’s also not willing to give us her intended return times. Different ages, different problems….sigh….